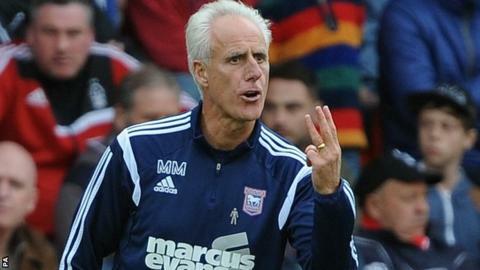 Ipswich Town manager Mick McCarthy labelled his side's second-half performance in the 3-1 loss to Cardiff as their worst of the season. Cardiff came from a goal down to end Town's unbeaten run of eight games. "The last two goals are comedy cuts. The second half, I didn't see that coming," former Sunderland and Wolves boss McCarthy told BBC Radio Suffolk. "We had a dreadful start to the second half and that's as bad as we've played. It was a real poor second half." Daryl Murphy had given Ipswich the lead with a superb half-volley before Peter Whittingham levelled with an equally impressive strike. After the break, Federico Macheda and Adam Le Fondre netted for the Bluebirds, both goals McCarthy felt were avoidable. "It was a comedy of errors. There were four ridiculous, poor clearances. If you make that many mistakes, it will end up with a big mistake," said the Ipswich boss, whose side dropped down to ninth in the Championship. "We need a reaction now for Saturday at home against Huddersfield. "If it's nine games again before I see anything like that, I'll be OK. But I surely don't want to see anything like that second half again for a long time."